"I Will Not Lose in Vietnam"
It was an unfortunate irony for Lyndon Johnson that the Vietnam problem loomed large from the very beginning of his presidency. Since the start of his political career in the 1930s, the issues that engaged him most were domestic ones—rural electrification, social security, unemployment, and education. Though not ignorant of world affairs1—he had spent more than two decades involved in defense and foreign-policy questions as a member of the House Naval Affairs and the House and Senate Armed Services Committees—Johnson found the realm of diplomacy and statecraft complicated and frustrating. When as vice president he visited Bangkok, he exploded in anger when a U.S. embassy official counseled him against shaking hands with the Thais, who traditionally recoil from physical contact with strangers. Dammit, Johnson exploded, he shook hands with people everywhere, and they loved it. Nor could he comprehend the way in which diplomacy seemed to be above politics, immune to the haggling he had perfected with American politicians, businesspeople, and labor leaders. Little wonder that he entered the White House with his eyes on matters at home—his main goal, he told aides only hours after being sworn in, was to enable all Americans to share in America's bounty. His first State of the Union address, delivered in January 1964, was the first since Franklin Roosevelt's to stress, by placement and by language, domestic affairs. Yet Johnson knew from the start that the war in Southeast Asia would demand a great deal of his attention. Since visiting the country on Kennedy's behalf in May 1961, he had followed the course of the war and the evolution of American policy and had sat in on many White House meetings. In the late autumn of 1963, he understood well the scope of America's commitment in Vietnam and the potential trouble the war could pose for him. When U.S. Ambassador Henry Cabot Lodge reported on the situation in Saigon on 24 November, Johnson said he felt like a catfish that had just "grabbed a big juicy worm with a right sharp hook in the middle of it." In a memorandum a few days later to Maxwell Taylor, the chairman of the Joint Chiefs of Staff (JCS), the new president noted that the more he looked at it, "the more it is clear to me that South Vietnam is our most critical military area right now." Johnson was determined to stand up to the challenge. Though he had opposed the coup against Diem, he was determined to carry out his predecessor's policies, particularly in the foreign arena. More important, he came to the White House with a deep and unquestioning commitment to the posture of staunch anticommunism, as well as to presidential supremacy in foreign affairs. The same was true of his predecessors in the office, but with Johnson the commitments were more deeply ingrained, more unalterable. Throughout his career he had always rallied behind the flag, making it his first rule to support the president whenever a foreign-policy crisis arose. "It is an American, not a political foreign policy that we have in the United States," he declared in 1948. "This is a question of patriotism, not politics." Six years later, when the Eisenhower team engineered a counterrevolutionary coup in Guatemala, Johnson said, "We've got to be for America first." On those occasions in the 1950s when he faulted presidents on foreign policy, it was usually for being insufficiently aggressive in waging the Cold War. He criticized Harry Truman for not destroying the Chinese in the Korean War, and he blasted Dwight Eisenhower for tolerating a supposed "missile gap" with the Soviet Union. On Vietnam Johnson strongly backed first Eisenhower's and then Kennedy's attempt to create an anticommunist bastion in the southern half of the country. In 1961 he returned from Saigon militant about the need to persevere in the conflict and warning darkly that failure to act decisively could force the United States to retreat to San Francisco and "leave the vast Pacific...a Red Sea." There is no reason to think that Johnson had modified that view by the time he assumed the presidency. Like many of his generation he was marked by the failure of the allies to stop Hitlerat Munich, and he often declared that he would not reward "aggression" in Vietnam with "appeasement." He also invoked the mythology of the Alamo, where, as he said, Texas boys had "fought for freedom." Moreover, history taught Johnson that right-wing adversaries would finish him politically should South Vietnam fall to communism—just hours after taking office, he vowed that he would not be the president who saw Vietnam go the way of China. As he later said to biographer Doris Kearns, in a dubious interpretation of the past: "I knew that Harry Truman and Dean Acheson had lost their effectiveness from the day that the communists took over in China. I believed that the loss of China had played a large role in the rise of Joe McCarthy. And I knew that all these problems, taken together, were chickenshit compared to what might happen if we lost Vietnam." Johnson opted to keep Kennedy's top foreign-policy advisers, and all of them recommended staying the course in Vietnam. It was Johnson more than his lieutenants, however, who set the tone for Vietnam policy in the early days after the assassination. At his first meeting on Vietnam, on24 November, he voiced concerns about the direction of American policy, and about growing congressional sentiment in favor of withdrawal, but then quickly affirmed that America's long-standing objectives could not be abandoned. The most important task, he said, was to win the war. Too much effort had been placed on "so-called social reforms," not enough on battling the enemy. Johnson instructed Henry Cabot Lodge, who was present at the meeting, to return to Saigon and tell Duong Van Minh and the other generals who made up the ruling Military Revolutionary Council (MRC) two things: that the bickering among them must stop, and that the United States would make good on its promise to provide them with economic and military assistance. "Lyndon Johnson intends to stand by our word," he told Lodge to say, and he added, "I will not lose in Vietnam." In a National Security Action Memorandum (NSAM 273) released two days later, Johnson reiterated that the United States would assist the South Vietnamese to "win their contest against the externally directed and supported Communist conspiracy." "Win the war." That was the essential message Johnson conveyed to his foreign-policy advisers in those early days after Dallas. He left little room for uncertainty about America's task in the struggle. According to one of the participants at the 24 November meeting, Johnson urged people to devote "every effort" to the conflict. "Don't go to bed at night until you have asked yourself, 'Have I done everything I could to further the American effort to assist South Vietnam?'" A few days later, when Johnson met with David Nes, who had been chosen as Henry Cabot Lodge's new deputy chief of mission in Saigon, he said failure was not an option against the Vietcong. "Lyndon Johnson is not going down as the president who lost Vietnam," Johnson said as Nes prepared to leave. "Don't you forget that." Determination was thus the watchword of the new administration from its first days. There was no fundamental reassessment of the rationale behind the U.S. commitment to preserving a separate, noncommunist, South Vietnam; no examination of whether such an objective was vital to U.S. security, or whether it was even attainable; no serious investigation of possible alternative solutions to the conflict. Assistant Secretary of State Roger Hilsman assured a visiting South Vietnamese official on 27 November that Johnson not only supported Kennedy's policies toward Vietnam, but helped in making them. As a result, the Saigon government could count on strong U.S. support in the war. Hilsman added that though the thousand-man withdrawal set for the end of the year would go ahead as planned, South Vietnamese leaders could rest assured that the United States would keep in Vietnam whatever forces were needed for victory. Ambassador Lodge, in a meeting with Minh three days later, also emphasized Johnson's commitment to the struggle against the Vietcong. And Dean Rusk, in a top-secret cable to Lodge on 6 December, stressed Johnson's "deep concern that our effort in Viet-Nam be stepped up to the highest pitch and that each day we ask ourselves what more we can do to further the struggle." There was continuity here, but also change. It is no contradiction tosay that Lyndon Johnson sought to maintain his predecessor's policies in Vietnam and that there occurred a subtle but crucial shift when he tookoffice, in the form of a greater presidential insistence on preventing defeat in Vietnam. It may be, as some have suggested, that Johnson had an excellent opportunity to withdraw from Vietnam immediately upon entering the White House, but it is virtually impossible to imagine him actually taking such a step. Perhaps any successor would have been inhibited from dramatically altering the slain leader's policy in those difficult weeks of transition; it was certainly out of the question for Johnson. Every fiber of his being compelled him to proceed. His reading of history told him to continue in the war, as did his calculations of what would serve him best in the 1964 presidential campaign—avoid radical departures in foreign affairs, play to the strength of domestic policy. Already suspicious to the point of paranoia about Robert F. Kennedy's ambitions and designs, he believed he would be opposed by RFK and his associates—Robert McNamara, Walt W. Rostow, McGeorge Bundy—if he did not pursue Kennedy's policies in Southeast Asia. For that matter, Johnson's temperament was the type to avoid the kind of reexamination of policy assumptions that would have been needed to initiate disengagement. His mind was excellent, fast and resourceful, but he had no interest in, or patience with, intellectual give and take. He sought only solutions to problems and tried whenever possible to avoid listening to the underlying rationales. As longtime assistant George Reedy would later put it, LBJ "could think but not reflect; devise ingenuous schemes for achieving goals but not ponder the validity of the goals; outguess his fellow human beings in playing the game of one-upsmanship without realizing that the game might not be worth playing." In foreign-policy matters, especially, Johnson lacked a detached critical perspective, which left him vulnerable to clichés and stereotypes about world affairs. Neither diplomatic history nor current international politics interested him (as more than a few visiting diplomats were quick to notice), and he was deeply insecure about his abilities as a statesman. Though he had gained valuable experience on his eleven goodwill trips abroad as vice president, many of these had been frustrating affairs for him as well as for his hosts (he often came across as a boor) and had aggravated his sense of being an interloper in the world arena. "Foreigners," Johnson quipped early in the administration, only half-jokingly, "are not like the folks I am used to." This insecurity, well documented in the reflections of those who knew him well, helps explain two closely related tendencies in Johnson's approach to Vietnam that were evident early and would prove highly important to policy making as time went on. One was his aversion to meeting with foreign diplomats or consulting with allied governments. McGeorge Bundy learned right away that one of his tasks would involve seeing to it that few foreign dignitaries made it into the Oval Office. In the years that followed Johnson would seldom welcome, much less seek out, the opinions and advice of allied government leaders on what should happen in Southeast Asia. As more and more of them came to oppose his Vietnam policy he looked for ways to avoid even speaking to them. Second, Johnson's lack of confidence in foreign policy helped fuel his well-documented dislike of dissension on Vietnam policy, even among his closest advisers. All politicians like consensus, but LBJ craved it more than most. Reedy again: "He abhorred dissent to a point where he sought to quell it long before the protagonists had taken themselves out." Early in the administration top aides began the practice of meeting among themselves before entering the Oval Office, in order to work out what they were going to say. Johnson, these advisers knew, would want various policy options articulated but, given both his temperament and his unambiguous exhortations in those first days, would not want deep and wide-ranging discussion of those options. Johnson's craving for internal consensus led him to try to limit Vietnam policy formulation to a small group of advisers, smaller than the one utilized by John F. Kennedy. From the start, the three key figures in that group were Secretary of Defense Robert McNamara, Secretary of State Dean Rusk, and National Security Adviser McGeorge Bundy. All three had helped shape the policy under Kennedy and thus had a stake in making sure the policy succeeded; all three would be key players, along with Johnson, in the decisions that over the next fifteen months would make Vietnam an American war. Others would contribute to the fateful decisions, of course, and help in implementing the policies—notably the chief deputies of the three advisers, as well as the successive ambassadors in Saigon—but this group was supreme. Despite his determination to continue the Kennedy policies, Johnson encountered a steadily disintegrating situation in South Vietnam. On the battlefield, the picture was grim. The new president had barely settled into the Oval Office before the CIA, the JCS, and the embassy in Saigon began issuing reports of virtually unchecked momentum by the Vietcong in almost all parts of South Vietnam. According to Defense Department figures presented at a high-level interdepartmental meeting in the first week ofDecember, Vietcong incidents had skyrocketed since the Diem coup, going as high as 1,000 in one week, as compared to the 1962 average of 363 per week, and the first-half-of-1963 average of 266 per week. The picture was especially bleak in several key provinces around Saigon. "The only progress made in Long An Province during the month of November 1963," Lodge reported, "has been by the Communist Viet Cong. "Troubling as these trends were to U.S. officials in Washington and Saigon, even more disconcerting was the Minh government's ambivalence with regard to the war effort—an ambivalence that had first materialized in early November but accelerated in December. The military situation could be turned around, Americans were convinced, but only if the Saigon regime was committed to doing so. Some American officials clung to the belief that the will was there, that present problems were the inevitable but short-term result of the transition to a new government. But a growing number of officials ascribed the lack of progress to the MRC's reluctance to initiate offensive military actions. Among the latter were General Harkins and the rest of the American military in Vietnam. Harkins had opposed the overthrow of the Ngos, and he made no secret of his dislike of Minh. He inundated administration officials in Washington with detailed information on the junta's nonaggressiveness; with time, many of those who had most opposed Diem and most welcomed the change in government would be converted to this view. It was not just Harkins's claims that convinced them. The Minh government took a number of specific actions contrary to American wishes and designed to shift the struggle to the political plane. To begin with, it announced its intention to implement a rural-welfare program designed to eventually supersede the strategic hamlets program instituted under Diem. Minh officials felt certain that the hamlets only exacerbated dissatisfaction in the countryside; they were convinced that the new program, which would permit peasants to remain in their scattered homes under the administration of local leaders, was more likely to win peasant allegiance than the American-backed strategic hamlets program, with its barbed-wire-enclosed compounds and aggressive military activity. In addition, the government refused to go along with a new Pentagon plan to improve the military situation by bombing the North. At a meeting with American officials, Minh argued that such bombing would be a mistake for the most fundamental reasons: it would hurt innocent people, it would alienate popular opinion in the South, and it would likely have no real effect on Vietcong troops fighting in the South. If Minh government officials disagreed with Americans on key issuesof policy, they also disagreed among themselves. They could not reach an accord on the best way to approach those groups most discriminated against by Diem—the Buddhists above all, but also the students and urban professionals. More important, although there was general agreement on the need to emphasize the political dimension of the struggle, there was little unity of thought on how fast or how far to proceed in that direction. Whether key government leaders such as Minh were prepared to consider a neutralist settlement to the conflict in this period is unclear. Publicly they denied it, and Minh told British Ambassador Gordon Etherington-Smith at the start of December that neutralism was not a practicable solution for South Vietnam, given that communists controlled North Vietnam. Nevertheless, in the latter part of November and early December, reports proliferated in Saigon intellectual circles and in the South Vietnamese press that leading members of the junta were sympathetic to such a solution. In mid November French officials in Saigon reported to Paris that many junta members were distraught at the delay in French recognition of the new government, particularly because they sought to move the GVN closer to France and away from the United States. The report noted that there appeared to be a division of opinion within the junta, with some members sympathetic to a neutralist settlement and others, including Minh, committed to pursuing the war against the Vietcong. As it had when Diem and Nhu appeared to consider the idea, the prospect of an early political settlement struck fear into American officials. The notion of a negotiated settlement between the Saigon regime and the NLF or Hanoi was anathema to them, and they were determined to prevent it. At the same time, American intelligence continued to find signs of MRC support for accommodation. In late November, the CIA reported that contacts between the Saigon regime and the NLF were taking place. The State Department's Bureau of Intelligence and Research, citing "reliable sources," made the same claim. And in fact, the NLF had issued a number of conciliatory statements in the weeks after the Minh government assumed power, all of which called for negotiations to reach a cease-fire, free general elections, and the subsequent formation of a coalition government "composed of representatives of all parties, tendencies, and strata of the South Vietnamese people." Reunification, the NLF declared, would be neither immediate nor automatic but something to be realized "step by step on a voluntary basis." This would be the official NLF line throughout the junta's time in office. Not all American officials believed that the top government leaders were prepared to agree to an immediate political settlement—Lodge, for one, thought Minh would likely veto any move in that direction. However, even Lodge readily conceded that the junta, given its desire to focus its energies on the political plane, might opt for political settlement eventually, perhaps within a matter of weeks. Perhaps neutralists would gain the upper hand in the decision making, or perhaps Minh and other leaders would move in that direction on their own. Equally worrisome, continued instability in Saigon might bring forth a new regime dedicated to ending the war. U.S. officials understood perfectly well that in this kind of fluid situation, in which anything was possible, pressure for negotiations from outside Vietnam could have enormous influence. And indeed, as 1963 drew to a close, such pressure was gaining momentum. In the United States, public and press opinion remained mostly supportive of the war, but murmurings of skepticism continued to be heardon Capitol Hill, as Johnson himself indicated on 24 November. The White House was particularly concerned about the growing concerns expressed by three key Democratic members of the Senate, Johnson's mentor Richard Russell, Majority Leader Mike Mansfield of Montana, and J. William Fulbright of Arkansas, chairman of the Senate Foreign Relations Committee. All three had grown increasingly dismayed with the direction of U.S. policy in recent months, and all three had the capacity to strongly influence thinking on Capitol Hill. In a telephone conversation with LBJ on 2 December Fulbright recommended that the administration opt for a negotiated settlement via a reconvened Geneva Conference. On 7 December Russell told Johnson, "We should get out [of Vietnam], but I don't know any way to get out." On another occasion in December Russell reportedly advised LBJ to "spend whatever it takes to bring to power a government that would ask us to go home." Mansfield, meanwhile, chose this time to launch a personal campaign to convince the president to pursue a political solution. It was a campaign he would not relinquish until Johnson opted to Americanize the war in the spring and summer of 1965. 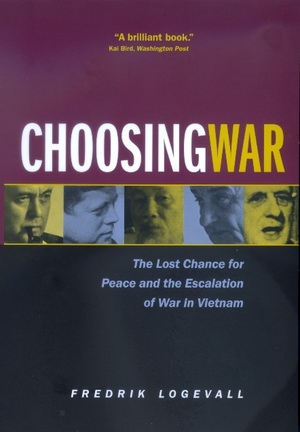 In a 7 December memorandum to Johnson, Mansfield suggested that two core administration assumptions—that the war could be won in South Vietnam alone, and that it could be won at a "limited expenditure of American lives and resources somewhere commensurate with our national interests in south Viet Nam"—might be mistaken. The war, he argued, might extend beyond South Vietnam, and "what national interests in Asia would steel the American people for the massive costs of an ever-deepening involvement of that kind?" Mansfield described the situation as increasingly similar to the Korean War of a decade earlier, and he reminded Johnson that Eisenhower did not pursue that war to victory but went to Korea "to make peace, in reality, a truce." As then, Mansfield suggested, "there may be a truce that could be won now in Viet Nam alone and eventually a peace which might be won throughout Southeast Asia at a price commensurate with American interests. That peace should mean, in the end, a Southeast Asia less dependent on our aid-resources and support, less under our control, not cut off from China but, still, not overwhelmed by China." The way to achieve such a peace, Mansfield argued, was, first and foremost, to encourage the new Saigon government to shift its primary emphasis from the military to the political side (he was apparently unaware that the new regime was planning to do just that). Such "political and social acts of popular benefit" were imperative, "even if it means curtailing the present elusive and so far unsuccessful chase of the Viet Cong all over the land." Second, the United States should take part in an "astute diplomatic offensive," along with France, Britain, India, and perhaps Russia and others, with the aim of making "a bonafide effort to bring about an end to the North-South Vietnamese conflict...France is the key country." American officials agreed that France was the key country, and it worried them. Concerns about pro-French sympathies in the Minh junta, first expressed in the immediate aftermath of the Diem coup, had not disappeared but had intensified in late November, despite the fact that de Gaulle proved slow in recognizing the new government. Lodge did not hide his concern. He worried that neutralist sentiment was growing in Saigon, and he implored Washington to intensify its efforts to persuade the French president to keep quiet before the entire South was converted to neutralism. CIA director John McCone was similarly troubled and told Johnson that it might be time for the United States to get tough with the French. But Johnson was reluctant. He later noted that from the start he "madeit a rule for myself and the U.S. government simply to ignore Presidentde Gaulle's attitudes on our policies." Johnson had little of Kennedy's interest in Europe, knew little of its history, and concerned himself mainly with keeping the western alliance on an even keel. He often said that the French president reminded him of his baseball-playing days: "I was feared as a power-hitter," he would explain, and rival pitchers (de Gaulle) would "try to dust me off, but I would just lean back and let the ball go into the catcher's mitt." This patience came as a surprise to presidential advisers, who had often seen Johnson take almost irrational offense at even minor criticism. A number of these individuals would later comment on the exceptional way in which Johnson seemed to view de Gaulle, even as the frequency of the French leader's criticisms increased. No one was more surprised than Undersecretary of State George Ball: "He incessantly restrained me from making critical comments, even though he would never have taken the general's constant needling from any other foreign leader." Charles Bohlen, the American ambassador in Paris, played a significant role in convincing Johnson to avoid a public confrontation with de Gaulle. In a memorandum sent soon after LBJ took office, Bohlen made note ofthe general's almost complete control over French foreign policy and recommended "great care in the avoidance of any derogatory statements in regard to de Gaulle which he will be able to use for his own purposes." Bohlen was convinced that de Gaulle, whom he described as "highly egocentric with touches indeed of megalomania," actually wanted strained relations with the United States. The general, Bohlen argued, viewed the nation as the only real international unit. He therefore disliked any form of integration or other association that watered down the sovereignty of the country; consequently, it was natural that he would stress the independence of France on all matters. It followed that the United States would be playing into de Gaulle's hands if it confronted him, whether on Vietnam or on any of the other issues that plagued Franco-American relations in the 1960s. The ambassador would later claim that it was he who convinced the president to "avoid fighting de Gaulle." In one of the most detailed and powerfully argued books published on American intervention in Vietnam, Fredrik Logevall examines the last great unanswered question on the war: Could the tragedy have been averted? His answer: a resounding yes. Challenging the prevailing myth that the outbreak of large-scale fighting in 1965 was essentially unavoidable, Choosing War argues that the Vietnam War was unnecessary, not merely in hindsight but in the context of its time. Why, then, did major war break out? Logevall shows it was partly because of the timidity of the key opponents of U.S. involvement, and partly because of the staunch opposition of the Kennedy and Johnson administrations to early negotiations. His superlative account shows that U.S. officials chose war over disengagement despite deep doubts about the war's prospects and about Vietnam's importance to U.S. security and over the opposition of important voices in the Congress, in the press, and in the world community. They did so because of concerns about credibility—not so much America's or the Democratic party's credibility, but their own personal credibility. Based on six years of painstaking research, this book is the first to place American policymaking on Vietnam in 1963-65 in its wider international context using multiarchival sources, many of them recently declassified. Here we see for the first time how the war played in the key world capitals—not merely in Washington, Saigon, and Hanoi, but also in Paris and London, in Tokyo and Ottawa, in Moscow and Beijing. Choosing War is a powerful and devastating account of fear, favor, and hypocrisy at the highest echelons of American government, a book that will change forever our understanding of the tragedy that was the Vietnam War. Fredrik Logevall is Associate Professor of History at the University of California, Santa Barbara.